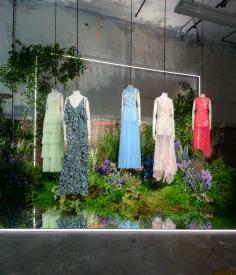 Scene setting: Jason Wu has always been a champion of femininity. This season, the designer upped the ante with a succinct collection of exquisite dresses and gowns, which represent the pinnacle of his label. Named ‘Jason Wu Collection’, the 16 pieces were revealed inside an 1869 concrete building in the heart of TriBeCa, filled with a bounty of flowers and framed in neon lights, marking Wu’s first non-runway showing in 11 years. Mood board: The juxtaposition of hard and soft carried over into the carefully crafted garments which featured divergent combinations such as pairing pinstripe fabric with additions of lace, sleek column silhouettes with architectural ruffles and adding thousands of eye-catching crystals to sheer organza. With peeling paint, exposed plaster and what appeared to be a wild garden growing out of the concrete, the presentation was an elegant reminder of Wu’s signature: a modern portrait of femininity. Best in show: Wu’s flair for form and construction stood stoically at the heart of the collection. Although statement pieces like the extravagant glittering gowns and draped dresses festooned with chiffon flowers packed a visible punch, it was his slightly more pared-back pieces, such as a pleated black two piece with wisps of ethereal lace around the neckline, that defined a new type of power dressing.